There is an old saying that states sometimes you have to break a few eggs to make an omelet. In Rocket Bottle Games’ new sliding block puzzle game, Chicken Scramble, you will be breaking plenty of eggs but not to make an omelet. This puzzle game will have you running “a fowl” (see what I did there?) and breaking eggs in order to hatch them and raise them from chick to sophisticated adult chicken with the flick of your finger. 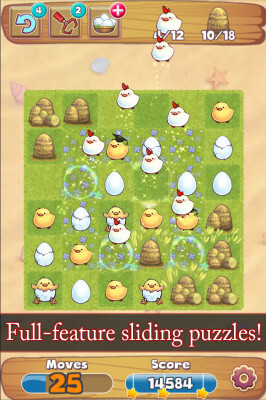 Chicken Scramble features 2048-style gameplay that can be played in quick sessions when you just want to clear a few boards and come back to it later. The game is packed with many challenging stages that vary wildly in size and shape and are populated by obstacles that you must maneuver around in order to solve the puzzles. Destructible hay bales, boulders and pesky dandelions will impede your path and try to make it difficult for you to be victorious. This free-to-play barnyard puzzler offers in-app purchases as well as full social integration so that you and your friends can play together or compete for high-score braggin’ rights. So what are you waiting for? Let’s get cracking! The basic premise to Chicken Scramble is to match two of the same chicken types together to make them grow. 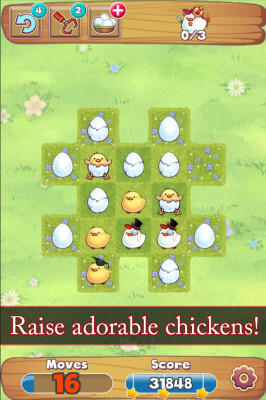 This is done by simply swiping the screen up, down, left or right to move all of the chickens in that direction. For example, combining two fresh eggs will create a cracked egg, combining two cracked eggs will create a baby chick and combining two baby chicks will create a young chicken and so on. Depending on the particular level that you are on will determine the types of chickens that you will need to match in order to meet that levels goal. As you swipe, the game places a new chicken egg (either fresh or cracked) onto the board to keep the action moving along. Each level has a certain number of swipes that are allowed before you lose a life. Clear the board in less than the given amount and you earn points towards earning stars with three stars being the most you can earn for each level. Chicken Scramble, being a free-to-play game, is set on a 30 minute timer. You begin a play session with five lives which allows you to play as many levels as you can clear in that 30 minute window. If you should happen to use all of your lives before the 30 minutes is up, you have to wait out your remaining time at which point the game clock will reset and you will receive five more lives and can continue attempting to clear levels. If you can’t wait for the time to run out, however, you can then purchase Gold Coins which can be used to gain additional lives to keep playing. Gold Coins range in price from 15 for $0.99 to 1025 for $49.99. Being that there is currently 80 levels available to play with the difficulty being increased with the advancement to new levels, at some point, those individuals that are enjoying their time playing may decide to pony up and purchase more Gold Coins in order to gain more lives and continue trying to clear those later levels. The graphics in Chicken Scramble are all done in hand drawn art work. The art style is very reminiscent of a child’s story book and helps to set the tone of being in a farmer’s barn yard. Baby chicks are cute and cuddly while the older chickens look very sophisticated in a monocle and top hat. The level select screen is done in bright, fun colors highlighting your journey from grassy meadow to snow covered mountain peak. Game levels also highlight the same whimsical designs with the focus being on the shape of the board and the different elements such as craggy boulders and golden hay bales. The graphical design of the game really sets the tone of the whole experience and makes for a fun time combining and growing your chickens. There is currently no soundtrack in Chicken Scramble but there are a bevy of sound effects that you will encounter during your time trying to clear the levels. When matching the correct level of chickens you will hear a cute little chirping sound to let you know that you have scored the correct match. In addition, when combining chickens next to a bale of hay, you will get the sound of hay blowing away in the wind. When you clear a particular level, you will get a fanfare tune as well as the sound of poppers with streamers and confetti filling the screen. It would have been nice to have some catchy little tunes playing in the back ground to help immerse you in the experience a little more but maybe that will be something that is added in a later update. Chicken Scramble was a lot more fun than I initially imagined and I found myself strategically planning out how to approach levels that were more challenging as I made my way deeper into the game. Being mainly a console gamer, I rarely get the chance to delve into casual games but it was a pleasant surprise being able to jump into this game, clear a few levels and then set it down for a spell. The free-to-play nature of this game may turn some players off as well as the time-limit to sessions. However, the 30 minute time limit isn’t so bad that I found myself just doing something else for the remaining ten or twelve minutes that I would usually be left with after losing my five lives and would just come back and attack the level where I had left off once the timer reset. The option to purchase additional Gold Coins in order to continue playing or to use other in-game functions may rub some people the wrong way but you absolutely do not have to purchase anything to experience all that this game has to offer. 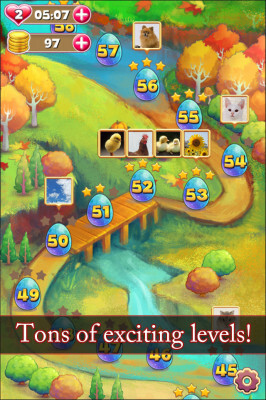 If you are a gamer that is into sliding block puzzle games then Chicken Scramble will definitely scratch that itch. UPDATE: After my review was originally posted, it was brought to my attention that Chicken Scramble does indeed offer a soundtrack that plays in the background while you play the game. In the settings menu, the game offers the option to toggle the background music on or off to suit the players preference and during my initial play-through, I inadvertently toggled the music off without realizing it. The game offers a very relaxing classical inspired piece that really does help to immerse you into the game and as such makes for a more complete experience. Because of this error on my part, I would like to apologize to Rocket Bottle Games and to the readers as this is something that I should have been aware of before writing my review. Not realizing that the game offers the choice to play music while trying to solve the puzzles is a huge omission on my part that warrants the updating of the score from 7.5 to 8.5. Yes, the music definitely makes a difference!